BioExcel works together with the core developers of widely used tools for biomolecular modeling and simulations. The GROMACS project started in 1995 as one of the first-ever parallel simulation codes, with strong focus on simulation efficiency and generality. It is the only package to support all common force fields and it has a very wide range of simulation algorithms. This combined with the very liberal (and business-friendly) licensing is likely a major factor why it is used as a simulation, minimization and energy evaluation library by several other applications e.g. in bioinformatics or distributed computing projects such as Folding@Home. The code is portable to a very wide range of platforms (including embedded ones), it includes manually tuned assembly kernels for a dozen different architecture instruction sets and accelerator support both for CUDA GPUs and Xeon Phi processors. 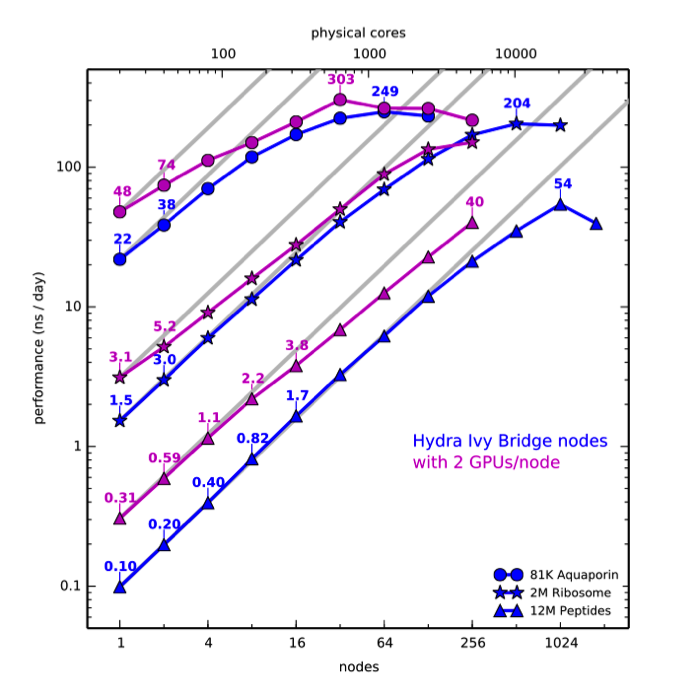 The package uses state-of-the-art neutral territory domain decomposition and multi-level parallelization to enable scaling both to tens of thousands of nodes on supercomputers and efficient high-throughput computing with accelerators. Read more about GROMACS activities at BioExcel. One integrative method that we have developed for over ten years now is our information-driven docking approach, HADDOCK. It supports the incorporation of a large variety of data from NMR and other biophysical methods (e.g. 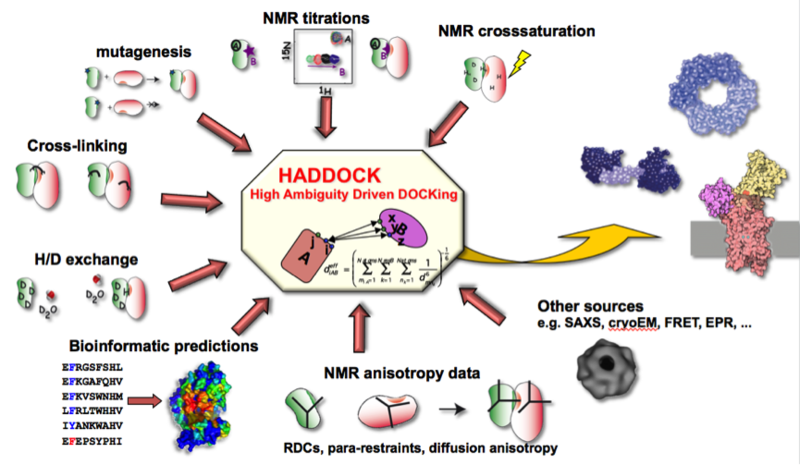 cross-links from MS, EPR-derived distances, mutagenesis data) to drive the modelling process, as well as the use of SAXS and IM-MS data to filter docking solutions. The software is made available through a user-friendly web interface, which has attracted a large user community worldwide (>5000 users), submitting a sustained number of computations to HTC infrastructures like the EGI (>2.5M jobs per year) (Figure 4) and resulted in over 110 deposited structures of complexes in the PDB. HADDOCK has demonstrated a strong performance in the blind docking experiment CAPRI, belonging to the best performing approaches and is currently the most cited software in its field. Read more about HADDOCK activities at BioExcel. CP2K is a state-of-the-art free and open source European package for Density Functional Theory and related methods, with a wide range of capabilities and excellent performance. It can be used to address problems in materials science, computational chemistry and, more recently, biomolecular research, and provides a framework for multiple modelling methods including hybrid (QM/MM) calculations useful for biological systems. PMX is a service for users who need to do free energy calculations. Free energy calculations are extremely common in life sciences research. In molecular dynamics simulations, such as investigating how mutations affect protein function, these calculations provide insight into stability and affinity changes. One important branch of free energy calculations involve alchemical transformations such as the mutation of amino acids, nucleic acids or ligand modifications. A challenging aspect of these calculations is the creation of associated structures and molecular topologies. pmx provides an automated framework for the introduction of amino acid mutations in proteins. Several state of the art force fields are supported that can be used in the GROMACS molecular dynamics package. Read more about PMX activities in BioExcel.